Peru is a country of rich heritage, natural and man-made wonders, home to the incredible Amazon Rainforest and Machu Picchu. One of the fastest growing countries in South America, much progress has been made in regards to reducing poverty, yet issues of social discrimination and inequality are still strong and are issues that FutureSense are working to address. Our work is focused in Urubamba, a small town located in the Sacred Valley and home to over 6 different ethnic groups. With a population of 16 000 people, the town is estimated to have 12% of the population lacking literacy skills. The region however is a very popular tourist destination due to its proximity to salt pools and access to extreme activities like paragliding and rafting. Peru has made incredible progress in recent years, reducing their poverty rate from 52% to 26% over an 8-year period, however inequalities between rural and urban regions are very much existent and have a large impact on quality education and healthcare. The low quality of Education in Peru is a significant concern. Significant barriers to quality education are a lack of appropriate infrastructure and inadequate learning materials along with poorly trained teachers. Dropout rates and quality education are big issues predominantly in rural areas, with low income and indigenous students. 44% of the rural population in Peru are living in poverty and lack access to basic healthcare facilities. In addition to this, 22% of the total population in Peru currently live at or below the poverty line, which means that many families struggle to afford quality, nourishing food. On top of this, most schools don’t teach about nutrition. This means that families struggle to make healthy choices when purchasing food which contributes to both malnutrition and high body mass. If you live in rural Peru, not only are you more likely to be living in poverty, but you will have less access to basic healthcare facilities. Inequalities that are related to rural areas, cultural identity and gender, are all factors that affect poverty status and access to quality education and healthcare. Our programs in Peru are continuing to develop every year and are based on the key challenges identified, in addition to UN SDG’s No 1. No Poverty, No 3. Good Health and Wellbeing, No 4. Quality Education and No 10. Reduced Inequalities. Through our Education program we develop engaging and influential workshops that focus on English, various life-skills and STEM education. Since rural communities in the Sacred Valley face multiple levels of disadvantage and have limited economic opportunities, our focus is on improving English and literacy skills to inspire children to take pride in their education and continue their learning. These skills are essential for children to enter secondary school and then later on gain employment, breaking the poverty cycle. We work very closely with the local teachers in delivering these programs and education. On our healthcare program, we focus on providing health-based education and training sessions at local schools or in the community. We focus on a variety of areas like researching health issues and completing needs-assessments, developing health education curriculum so we can improve issues like malnutrition, high rates of influenza and pneumonia and reducing dietary risks. We work very closely with our partners so they feel empowered to assist us in delivering this information effectively. 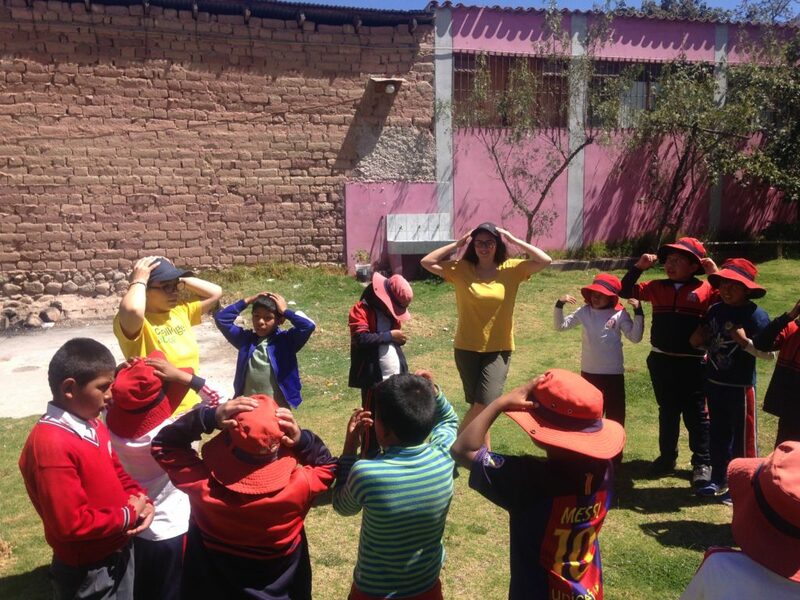 "By organising the work of participants in our projects, I feel my own contribution is enhanced and the wellbeing of the children in the Sacred Valley in Peru increased. Every day I am reminded by the children of how grateful they are for our work, and that makes my day a great one".